The full PuLMo artificial lung system in operation. LOS ALAMOS, N.M., April 25, 2016—Scientists at Los Alamos National Laboratory are developing a miniature, tissue-engineered artificial lung that mimics the response of the human lung to drugs, toxins and other agents. Nicknamed “PuLMo” for Pulmonary Lung Model, the device consists of two major parts, the bronchiolar unit and the alveolar unit—just like the human lung. 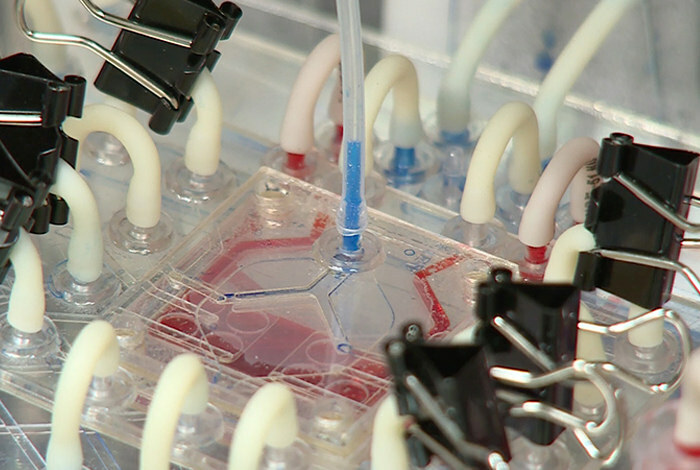 The units are primarily made from various polymers and are connected by a microfluidic “circuit board” that manages fluid and air flow. “When we build our lung, we not only take into account the aspects of different cell types, the tissues that are involved, we also take into account that a lung is supposed to breathe, so PuLMo actually breathes,” said Pulak Nath of Applied Modern Physics, who leads engineering efforts for the project. The most exciting application of PuLMo is a potentially revolutionary improvement in the reliability of drug-toxicity assessments and the prediction of new pharmaceutical success in humans, according to Harris. “Historically, drug trials have been done in many different types of animals. Some of them have passed animal trials and in human trials they’ve failed or even killed people,” she said. The PuLMo may also be designed to mimic lung disease conditions, such as Chronic Obstructive Pulmonary Disease (COPD) and asthma, and may be used to study lung air-flow dynamics to better understand the mechanisms of toxins and drug delivery and the effects of smoking, particularly the less-understood effects of e-cigarettes. Major funding for the PuLMo project is provided by the Defense Threat Reduction Agency. PuLMo is part of the larger ATHENA program to design an integrated, miniaturized surrogate human organ system that includes the heart, liver, lung and kidney. “It has been an extremely exciting project. Every day we are facing new challenges and every day we are coming up with solutions to address those challenges,” said Nath. Image for photo below: The PuLMo alveolar unit is readied for testing. DTRA approved for public release, unlimited distribution.